Michael Shields, 24, is from Elletsville, Indiana. He trained wrestling when in high school, then he went to USA boxing for awhile, yet he always knew he wanted to be an MMA fighter. When he heard about a competition for Indiana Cage Fightingin December 2008, he jumped right into it. 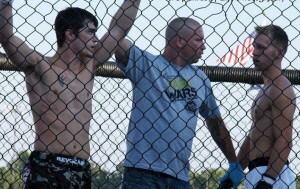 His first fight lasted 43 seconds and ended by referee stoppage due to strikes (TKO). Michael said he was hooked right there and then. His amateur MMA record before MMA got sanctioned in Indiana was 17-1-1, with his wins evenly distributed between submissions, KO's and TKO's. 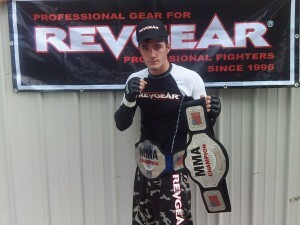 He became the undefeated Champion of bothElite Cage Fighting (EFC) and Indiana Cage Fighting (ICF). Michael is self taught in MMA. He mostly learns from watching videos although he has had coaches in Muay Thai, wrestling and grappling for a limited time. He trains 5 to 6 days a week, 2-3 times a day, runs at least 1-3 miles every day in the morning. Michael is planning to make a Pro debut in the next couple of months but he wants to go to a training camp first.